Holi is not just about playing with colors, its about meeting & greeting friends & enjoying yummy foods & mithais with all your near & dear ones!! Here is a recipe I took from a friend for yummy gujiyas. They may seem tiring to make but will taste wonderful once made. Roast khoya till it turns very light caramel color. Keep stirring it continuously or it will burn! Keep it aside. Roast Suji the same way. Suji will take much less time than khoya. Keep it aside. Mix sugar & all the above ingredients and your filling is ready. 1. Prepare dough: Melt ghee and rub it with the flour. Work the flour well with your hands so ghee gets mixed in. Take water and make a stiff dough, like you would make for puris. Cover it with a wet cloth and leave aside for about 30 minutes. Work the dough again to make it smooth. Spend about 10 minutes doing this. 2. Make lemon size balls from the dough and cover them with wet cloth to prevent drying. 3. Make Puris: Now take one ball and roll it like a puri, about 4 inches diameter. 5. Heat oil in a heavy bottomed kadhai, (medium flame, not very hot oil). Keep the flame somewhere between low to medium. Fry two to three gujiyas at a time and let them turn light brown by turning often. Take them out on a paper towel and let them cool. VOILA>> GUJIYAS R READY>>>HAPPY HOLI!!!! HOLI is here & so are yummy GUJIYAS!!! Make these delicious khoya filled gujiyas for holi & enjoy this festival of colors!! 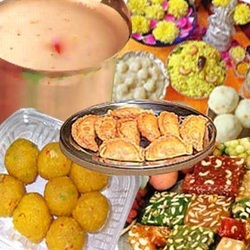 Roopali Gupta Jain says, "use any unwanted khoya or kaju barfis for preparing filling for gujiyas! !